I’ve known these two guys for a while now and it had been my great fortune to have been at the birth of most of their work. Of The Earth, Frank Hannon Band and now as Jeff and Mike. That being said, let’s talk about their latest effort Project Playlist. I cannot tell you how many times I received a text or an excited phone call from Mike telling me to “check out this riff” or “what do you think about this?” there was passion in those messages and that fervor and passion found its way to the record untarnished. Jeff, on the other hand, is like a Zen Master, calm, cool, and collected. His lyrics and powerful yet smooth vocals carry weight and presence that in my opinion border on legendary. Let’s get into the tracks and stroll around a bit. Project Playlist opens with “The Good Fight” (which happens to be my go to track on this record). Have you ever heard a song that just stays with you? I mean one that you find yourself hitting repeat over and over again? One that you manage to find something new with each listen? You find yourself absent-mindedly humming or tapping the beat throughout the day? “The Good Fight” just happens to be a song like that. Even cooler is that a couple of my close friends wrote it. I tried to put that aside and came to the conclusion that the fact that they were my friends was irrelevant, this is a damn good song, period. As I continued to listen to “The Good Fight” I compared it side by side with other songs and artists I consider in the same vein. This comparison led me to the conclusion that this track by a couple of guys that live in my town and I know personally can go toe to toe with artists like SIXX A.M., Pop Evil, STP, etc., etc. This track features studio wizard Chris Collier on drums and bass as well as production. “So Long”, featuring Will Hunt on Drums, has a fresh , yet familiar feeling and yet stays unique. Powerful and yet not abrasive in away this is a song that one could use to set the pace of their impending day. Feeling good and energetic is what this track brings to me. “It’s All I need” features Kurt Arft on bass and Chris Collier on drums and really packs a punch. Deep lyrics and Jeff’s powerful vocals give this song some weight. This is a heavy song but not overbearing if you get my meaning. Their craftsmanship shines through here. “Beggars And Thieves” features Kurt Arft again on bass and Will Hunt on drums. This track is probably the “grooviest” one on the record and will have your head bobbing and foot tapping as soon as you start listening to it. There’s a couple of twin guitar parts that Mike just kills with. Project Playlist closes out with “No Answer” which features Frank Hannon has that 70’s vibe that just goes so well with this song. I love the guitar wok in this track. Nice way to close out the record with some quality music and friends. What do we ultimately get with Project Playlist? A Rock and Roll record that stands up in this turbulent time in the music industry. Jeff and Mike said “Damn the norm, we’re gonna make the music that we feel inside” and it works, on so many levels. Music at its purest level is what we have here folks. I must also give shout outs to Kurt Arft, Will Hunt, and Frank Hannon for stepping up and going toe to toe with Jeff and Mike. Their performances are outstanding on this record. I didn’t forget Chris Collier, not only did he deliver some killer bass and drums, like a mad scientist he grafted it all together to deliver a superior recording. I think that in today’s DIY music industry production quality has suffered at the hands of inexperience in record production. Jeff and Mike know the value of a properly produced record and have developed a relationship with Chris that works. 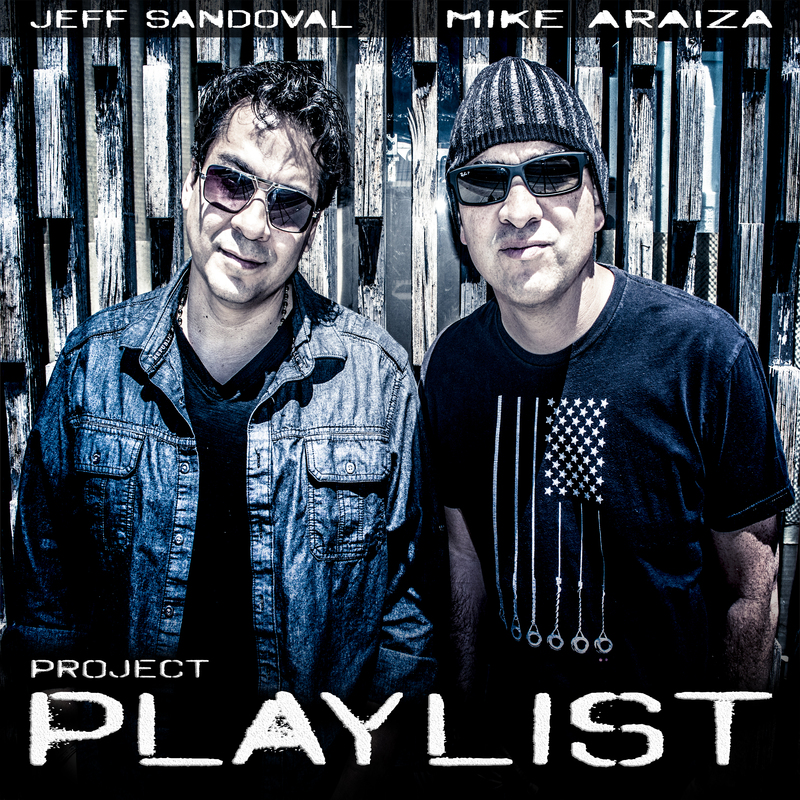 So, after all of that why should you get a copy of Project Playlist? I could say because they are my friends and it would be cool to help them out, but I’m not. You should get this record because it’s great music, that’s it in a nutshell. Now, you only have until Friday 08/12/16 to get your order in at https://squareup.com/store/JeffAndMike after that you will only be able to pick it up at live performances. Good news is new music is already being made so stay tuned.